With room for seven and highway gas mileage in the mid-twenties, the front-wheel-drive (FWD) Chevy Traverse LTZ crossover offers a compelling feature set, with a spacious interior that’s chock full ‘o creature comforts. 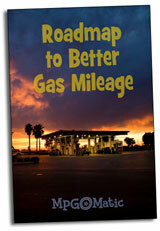 The EPA’s fuel economy estimates for the 2009 Chevy Traverse FWD LTZ are 17 city / 24 highway miles per gallon (MPG). The AWD Traverse is rated at 16 city 23 highway. We put well over five hundred miles on the odometer of our Dark Cherry Metallic FWD review unit and eased past the official mileage estimates with an average of 25.6 MPG on the Interstate highway and 21.9 MPG combined. Overall test period temperatures were in the upper sixties to low eighties. Interstate highway testing temperatures ranged from the high seventies to eighty degrees. The seven-passenger Traverse provides a solid combination of fuel-efficiency and performance. The 22.0 gallon gas tank allows a generous amount of range on the open road, while the V6 is designed to run on regular unleaded fuel. The Driver’s Information Center provides two trip meters, average fuel economy, instant fuel economy, and tire pressure data, among other stats. As always, we recommend driving with the instant fuel economy display active, in order to achieve the best gas mileage with a light-footed driving technique. While maneuvering a seven-passenger crossover can be a chore in tight spaces, the Traverse LTZ provides a trio of helpful features. These are especially welcome, given the vehicle’s rearward visibility. When you drop the Traverse into reverse, the Ultrasonic Rear Parking Assist and Navigation System-based Rear Camera are invaluable. But our favorite of the trio is the passenger side rearview mirror that automatically tilts to show the road surface as you back up. This aids in parking by helping to avoid those pesky clipped curbs. The side mirrors are also outfitted with blind spot helpers. The Traverse LTZ cabin is extra kind to the captain and first mate. An 8-way power driver’s seat is standard, as is lumbar support, and extensive automatic settings. The leather-trimmed front seats aren’t just heated, they’re air-conditioned, as well. (This just might be our favorite feature on a hot sticky summer day.) The climate controls are tri-zone, with rear ceiling vents. Our test unit was decked out with the optional Dual Skyscape Sunroof and DVD Rear Seat Entertainment package. There’s a 12-volt outlet at the base of the dash, 12-volt and 115-volt outlets at the back of the center console, and another 12-volt outlet in the cargo area. While we were disappointed that digital audio system lacked USB input and was limited to simple auxiliary jacks, there are two – one on the dash, and the other in the second row, where you’ll also find A/V inputs. The audio systems touch screen controls make it easy to find the right station for the times when your eyes needn’t be on the road. And for those that do, the steering wheel puts it at your fingertips. Both Bluetooth support and OnStar are standard issue. All-in-all, we found the Traverse LTZ to be a feature-packed family cruiser, with plenty of space and all the amenities, whether you’re running the local route or on a long-distance road trip. This modern crossover is well-worth a look for folks ready to swap out of a more thirsty conventional full-size SUV.